Vancouver, British Columbia--(Newsfile Corp. - June 13, 2018) - Defiance Silver Corp. (TSXV: DEF) (OTC: DNCVF) ("Defiance") is pleased to announce that it has entered into a binding agreement to acquire MAG Silver's Zacatecas Silver District holdings. As consideration for the sale, MAG will acquire 5,000,000 common shares of Defiance representing an approximate 5% strategic investment position. 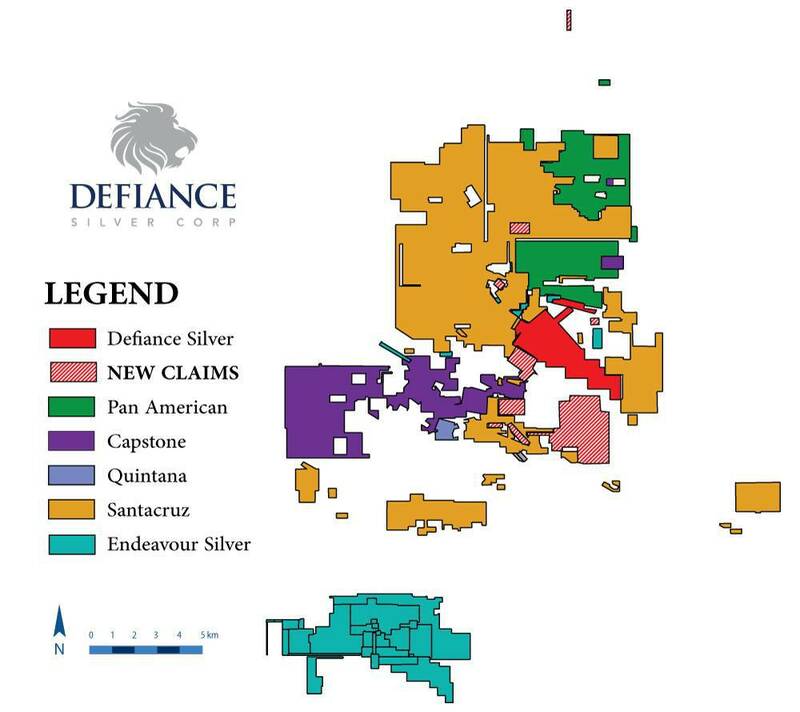 Defiance will receive a 100% interest in MAG's Lagartos Project along with a significant regional exploration database covering 135,000ha stretching from the Zacatecas to the Fresnillo Silver Districts. The transaction will provide Defiance control over a 1,506ha land package within the rapidly consolidating Zacatecas Silver district including over 65% of the Veta Grande vein, the San Acacio Silver Deposit (16.9M oz in 2.9 MT grading 182.42 grams per tonne silver inferred resource, see Defiance News Release dated January 15, 2015) and concessions bordering both the San Acacio deposit and veins being advanced by Pan American Silver, Capstone Mining and Endeavour Silver. Completion of the transaction is subject to a number of conditions precedent, including approval of the TSXV. Closing is expected to occur on or about June 22, 2018. Dr. Peter Megaw, MAG's Chief Exploration Officer commented, "With the Zacatecas Silver District consolidating, MAG was approached by a number of companies looking to acquire its holdings in the camp. MAG chose to partner with Defiance because of our long-held interest in the exploration potential of the Veta Grande Vein, the second most important vein in the billion-ounce Zacatecas silver district. A number of high-grade ore-shoots have been found along its length and the ability to expand exploration to a continuous 5.6 km stretch of this historically under-explored vein greatly enhances the potential for discovering more. This strategic interest in Defiance provides MAG with exposure to the upside of future discoveries as their exploration of this important vein advances." "With a number of silver miners actively consolidating the Zacatecas Silver District, we are excited that MAG chose to sell its Lagartos project to Defiance," stated Peter J. Hawley, President and CEO. "This is an accretive and transformational acquisition for Defiance, receiving a 100%, royalty-free interest in the Lagartos project along with a regional database that cost over $10 million to create. With new concessions adjacent to our current land holdings to the northwest and southeast, this acquisition further consolidates our presence in the area and enhances the district-scalability of the San Acacio project." The Lagartos Project consists of 14 concessions totaling approximately 800 hectares (Figure 1). In addition, Defiance will also receive a database covering an additional 135,000 hectares in the Zacatecas silver district providing the opportunity to acquire further concessions. All of the Lagartos concessions are located within the Zacatecas silver district, which has produced an estimated billion ounces of silver, principally before 1895. Zacatecas lies along the "Fresnillo Silver Trend" a regional structural zone that has yielded over 5 billion ounces of silver. The four largest districts along the trend; Guanajuato, Zacatecas, Sombrerete and Fresnillo are all characterized by multiple sets of parallel silver-gold veins with high-grade oreshoots located periodically along their lengths. The Zacatecas District is characterized by six major sets of such parallel veins. This consolidation gives Defiance control of over 65% of the Veta Grande vein, which historically produced a significant amount of silver within the district. A number of the other newly acquired Lagartos concessions lie along other important vein systems in the Zacatecas Silver District including: the Malanoche vein system currently being mined by Capstone Mining Corp.; the Cantera - El Bote vein system; and the Panuco vein system controlled by Santacruz Silver Mining Ltd. and Pan American Silver Corp. It is believed that all the known deposits were found in outcrop 350 to 500 years ago, while new vein systems remain to be discovered. Figure 1. Defiance Silver Current and Newly Added Concessions. Please click here or on image to view full size. MAG's exploration programs successfully identified a number of broad (10s of meters wide) hydrothermal alteration zones along structures up to 4 kilometers long that appear to represent the upper level manifestations of deeper Zacatecas and/or Fresnillo (Juanicipio)-style epithermal vein mineralization. Select grab samples along these zones returned values ranging from one half ounce up to 2.3 kilograms silver (67 ounces). Significant drilling highlights include 850 g/t (24.8 ounces per tonne) silver over 0.95 meters; 417 g/t (12.1 ounces per tonne) silver over 1.0 meter (See MAG Silver News Release dated Jan 19, 2010). Selected grab samples are not necessarily representative of the mineralization hosted on the property. All core drilled by MAG Silver in the district. Defiance Silver Corp. (TSXV: DEF) (OTC: DNCVF) (FSE: D4E) is a silver explorer and developer advancing the San Acacio Deposit, located in the historic Zacatecas Silver District of central Mexico. Defiance is managed by a team of proven mine developers with a track record of exploring and developing 7 operating mines to date. Defiance's corporate mandate is to expand San Acacio to become one of Mexico's premier high grade wide vein silver deposits. A Panoramic Video on the San Acacio Deposit is available on our website. Mr. Peter J. Hawley, P.Geo. Interim President & CEO, Chairman of the Board to Defiance Silver Corp, is a Qualified Person within the meaning of National Instrument 43-101, and has approved the technical information concerning the Company's material mineral properties contained in this press release.